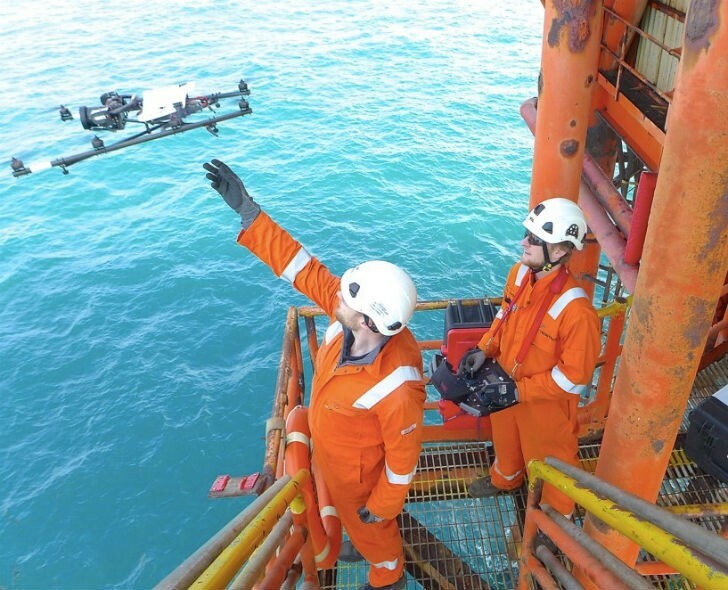 Cyberhawk Innovations, which specializes in in aerial inspection using Remotely Operated Aerial Vehicles (ROAV), also referred to as drones or Unmanned Aerial Vehicles (UAV), has completed an offshore ROAV inspection in North America for one of the world’s largest oil and gas supermajors. The multiple workscope project was completed over the course of two weeks in Newfoundland, Canada. Cyberhawk used ROAVs to inspect the live flare, the platform underdeck and the roof of the giant concrete gravity base, and conduct numerous thermal surveys in order to maximize the mobilization. A back log of complex inspection and survey work was competed while the Cyberhawk team was on the platform. ROAVs were selected as the preferred method of inspection for this project, primarily to reduce safety risks posed to personnel in the notoriously hazardous, foggy conditions present off the east coast of Canada. Stringent HSE regulations imposed mean that frequent inspection of offshore assets is required, in order to verify the integrity of the asset and maintain an operating licence. Due to the short weather windows available, the speed of ROAV inspection and the ability to capture large amounts of data in a short time presented a significant advantage. Malcolm Connolly, technical director and founder of Cyberhawk, was part of the team mobilized back in August 2015. He said: “Cyberhawk is well-known for pushing the boundaries of what is possible in the field of ROAV inspection, however even with eight years of rope access inspection experience and seven years using ROAVs, this was one of the most challenging projects I have been involved in. “Carrying out the underdeck inspection workscope alone would have taken weeks of complex overside work for a rope access team, or months for scaffolding to be erected. Add to that the challenging weather conditions on the Grand Banks and this would realistically have resulted in an inspection campaign spanning over the whole summer. “The main advantage that the ROAV had over other access techniques in this instance was its speed and its ability to capture large amounts of inspection information in short periods. Although the ROAV is able to operate safely in 30kts of wind, during this project we were only able to fly on five out of 15 days due to either fog or gale force winds. The number of areas that were inspected in five productive days proves the speed and efficiency of ROAV inspection.